Estimate the concrete, rebar, gravel, and form material needed for a concrete driveway installation and get a price estimate by planning the location on a map or by entering the length and width. Select points on the map to mark out your driveway. Results are shown below the map and will update automatically. *Estimate only - costs vary by location/vendor, selected material, and quantities. Concrete is a beautiful, long-lasting, and maintenance-free choice for a driveway. There are many steps in preparing for a driveway project, and one of the most important is having the right materials ready for the job. Of course you need to order the right concrete for your driveway, but before that you also need to have a proper base prepared, a rebar grid installed, and forms ready to contain the concrete while it hardens. Concrete is measured by the cubic yard, which is a measure of volume. To find the amount of concrete needed for a driveway you simply find the volume of the space to fill, in yards. Start by finding the area of the driveway in square feet. Multiply the length in feet by the width in feet to find the square footage. Next, multiply the area in feet by the depth in feet. Since the depth of a driveway is commonly measured in inches, divide the inch measurement by 12 to find the depth in feet. Multiply the square footage by the depth in feet to find the volume of the space in cubic feet. Volume is found by measuring length × width × depth. Finally, divide the cubic footage by 27 to find the volume in cubic yards. This is the amount of concrete needed. Let’s illustrate this using an example of a driveway that is 20’ wide by 50’ long and has a depth of 8″. Our concrete calculator makes it easy to estimate concrete and can be used in lieu of the equations above. When installing a new concrete driveway it is important to add reinforcement to prevent major cracking as the driveway shifts. This can be done by adding a grid of rebar or by adding fiber mesh to the concrete mix. If you choose to use rebar, it is often recommended to use a #3 or #4 rebar installed in a grid spaced 12″ apart. To estimate rebar for a regular driveway that is a standard rectangle you’ll need to know the length and width. You’ll need a row or column every 12″ of the driveway, spaced about 3-6″ from the edge. Subtract 6-12″ from the length and width measurements to get the length and width of the rebar grid. To find the rows of rebar in the grid, find the length of the grid in feet to find the number of pieces of rebar, and they should be equal to the width of the grid in length. To find the columns of rebar in the grid, find the width of the grid in feet to find the number of pieces of rebar, and the length of the grid is the length of the rebar pieces. To estimate rebar for an irregular driveway you’ll need to know the area of the driveway in square footage and the perimeter of the driveway in feet. Multiply the square footage by 2 and add that to the perimeter divided by 2. Most concrete contractors recommend installing a base of compacted gravel that is 4″ deep below the driveway. This is added to prevent settling and erosion and assists with drainage beneath the driveway. Gravel is often sold by the cubic yard, so the amount needed can be found using the same method used to find the cubic yards of concrete. Use our cubic yardage calculator to find the amount of gravel needed for your driveway project. When installing a concrete driveway it will be important to set up forms to content the concrete while it cures. A form is commonly a board secured to stakes that are driven into the ground and installed in the shape of the driveway. For straight sections you can use 2×4 or a 2×6 pieces of dimensional lumber. For curved areas hardboard siding makes a nice flexible form and is easily attached to wooden stakes. The amount of form material needed is equal to the perimeter of the driveway. There are two forms of stakes that can be used to secure the forms to the ground. 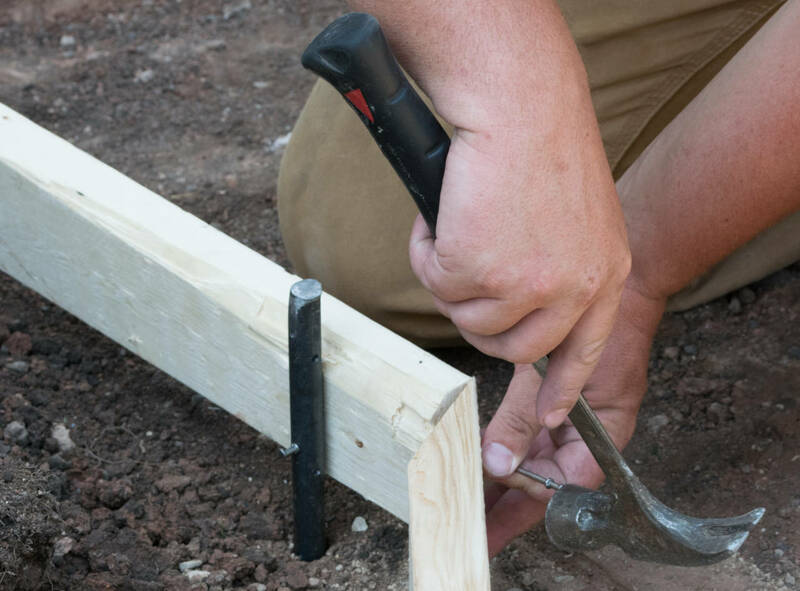 Most professionals use steel concrete pins, which are basically large metal stakes with nail holes and are intended to be reused on many projects. A second and more cost-effective option is to use long wooden stakes, which can usually be used only once. Installing a concrete driveway usually costs $4,000 – $8,500, and requires several materials that should be planned out in detail before starting the project. Use our calculator above to help plan out your driveway project. See our gravel driveway calculator if you are exploring using gravel as an alternative option for your project. Are You Planning a Concrete, Stone, & Brick Project? Get hassle-free estimates from local concrete, stone, & brick professionals and find out how much your project will cost.